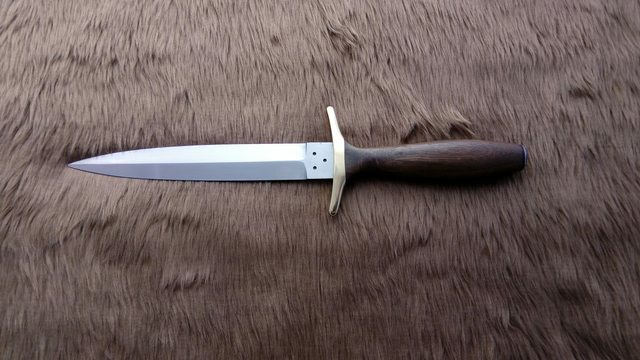 I was able to get most of them done this week and as I had not done a dagger before I was rather pleased with how the 6 1/2 inch 1095 it came out. 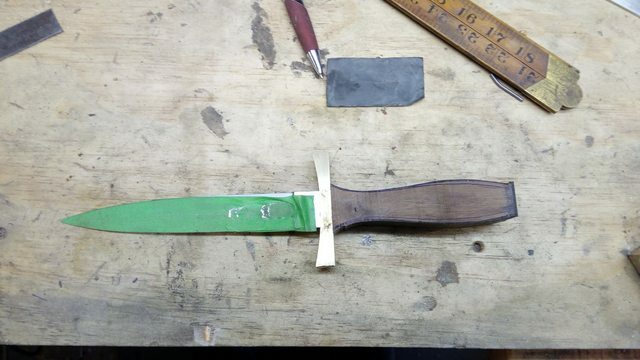 I have no use for this type of knife but it was a challenge to my grinding abiity to have a try at the double edge so that was the motivation for this one. After the tang was peened and the shaping was done I was reasonably pleased with the first try at this type of knife. 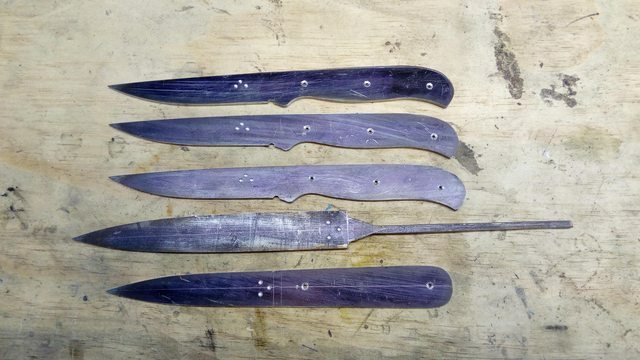 The guard was piece of 1/2 x 1/2 brass that I ground the blade side curve on the 12 inch wheel before I started to do the tang slot and shaped the rest of the guard when it was all together at shaping time when the tip of the guard were tapered down to about a 1/4 in square before it was a rounded off. The walnut handle was polished with the same buff after the brass was done and this gave it a very nice dark finish. 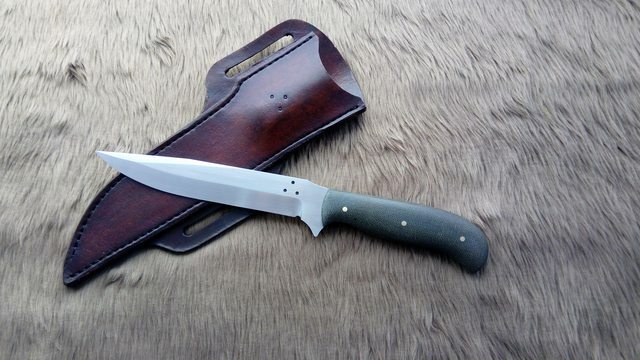 There was also a J T Ranger completed with a OD canvas micarta handle on the 5 1/2 inch 1095 blade. 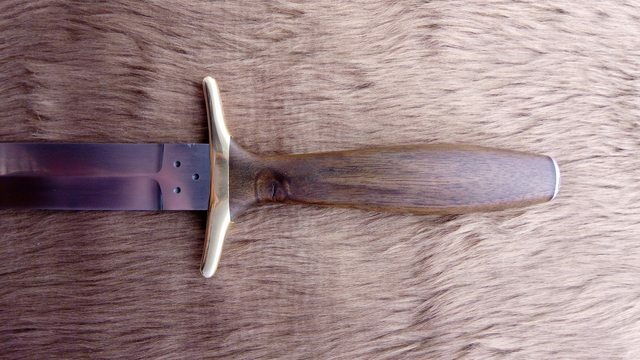 I love the Sgian Dubh , very simple and pretty. I like them all Garry. Nice touch on rotating your mark on the dagger. Perfect symmetry is always pleasing to the eye. I think you should be very pleased with that dagger. Clean lines and nice flow. It looks like I will have to make another couple of those to cover the "put my name on one of those" after I showed it on my FB page. That is another lot Billy. 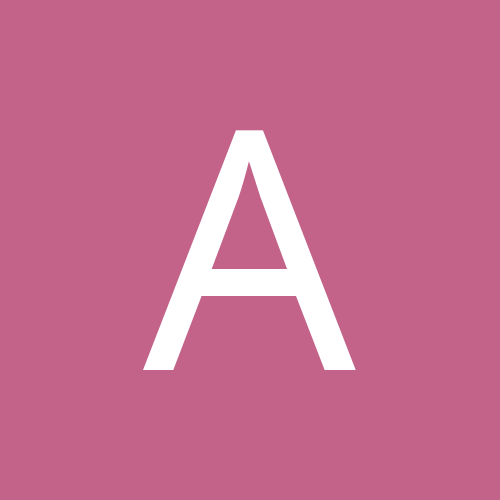 I posted the ones you asked about in the other thread.